The Peak Forest Tramway was originally planned to be about four-miles long, running from Chapel Milton to the limestone quarries at Dove Holes but the Peak Forest Canal Company, acting on the advice of Benjamin Outram and Thomas Brown, their consulting and resident engineers respectively, decided to terminate the canal at the village of Bugsworth. This was as far forward as the Peak Forest Canal could be cut without the need for a second flight of locks. Authorisation for this change in design was given on the 8 July 1795 and, as built, the tramway from Bugsworth to Dove Holes was about 6 miles long. At first, the tramway was single track, with passing places, and the gauge was 4 feet 2 inches. The Peak Forest Tramway was the first to be built by Benjamin Outram that fully complied with his famous paper, 'Minutes to be observed in the Construction of Railways', first published in February 1801 in the periodical, Recreations in Agriculture. This periodical was almost entirely written by Dr James Anderson, a Scottish economist (also described as a lawyer, scientist, agriculturalist and writer) whose daughter, Margaret, married Benjamin Outram on the 4 June 1800. 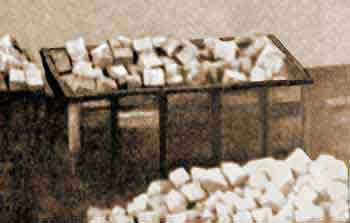 The L-section, cast-iron rails used in the construction of the Peak Forest Tramway were one yard long, weighing about 56 pounds, and initially they were fastened directly onto stone sleeper blocks. The blocks had a hole in the centre, into which was fitted an oak plug. The rails had a tapered slot at each end and when two rails were butted together these formed a rectangular opening. A wrought-iron spike, with a tapered-rectangular head, was then driven through the opening and into the plug, thus securing the rails to the blocks. In cross-section, the rails were about 4 5/l6 inches wide, with a flange on the inner edge 3¾ inches high in the centre and 3 inches high at each end. At that time, rails were variously known as 'Cast Metal Railways', 'Cast Iron Railways', 'Plates' or 'Gang Rails'. The Peak Forest Tramway opened for trade on the 31 August 1796 and its primary function was to act as a feeder for the Peak Forest Canal in the transportation of limestone and, later, burnt lime as well. It was an immediate success and in 1803 it was so busy that the main line was made double track throughout with the exception of Stodhart Tunnel and under Buxton Road Bridge at Chapel-en-le-Frith, using the same method of construction. Over subsequent years, the design of both rails and saddles underwent many modifications, even though the basic design remained unchanged. In spite of these modifications, rail breakage remained a constant problem and in circa 1865 much of the main line was replaced by L-section, steel rail, cut into lengths of 9 and 12 feet. These were rolled at the Gorton Works (better known as 'Gorton Tank') of the Manchester, Sheffield and Lincolnshire Railway Company, who by this time had control of the Peak Forest Canal and Tramway. Cast iron is a brittle metal and its replacement by steel rail was undertaken in order to eliminate rail breakage problems. The Peak Forest Tramway was gravity operated, that is, waggons travelled down it under the action of gravity and horse teams were used to haul the waggons back to the quarries. Above Chapel-en-le-Frith the tramway had to negotiate a steep hillside and a self-acting inclined plane was built there so that descending loaded waggons could haul up ascending empty waggons by attaching them to an endless chain or rope. It is interesting to note that over its long period of use (almost 130 years) that its mode of operation never changed. When the tramway opened there was a second inclined plane at its original terminus at Load's Knowl at the top of Barmoor Clough. This accessed the original quarry and it was only 33 yards long, operated by a horse gin. 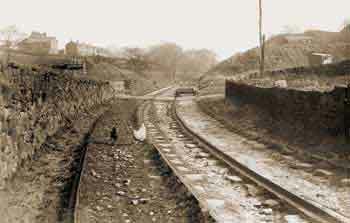 Shortly afterwards, the main line was extended into Doveholes Dale and this caused this quarry and its inclined plane to be abandoned. 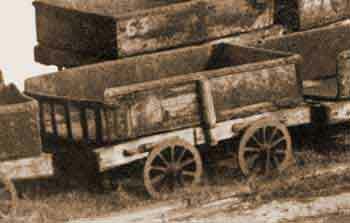 The mineral waggons, used to carry limestone down to Bugsworth from the quarries at Dove Holes, consisted of a substantial wooden chassis and a wrought-iron container that was held in place on the chassis by means of two wooden wedges, one on either side of the container. The axles were bolted onto axle trees mounted below the chassis and the cast-iron wheels (approximately 20 inches in diameter) were secured onto the axles by linchpins (known locally as 'lily-pins'). 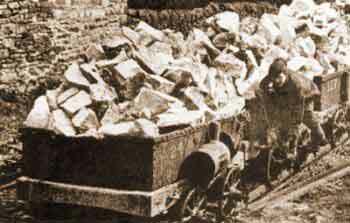 An empty waggon weighed between ¾ and 1 ton. It could carry a load of between 2 and 2½ tons, the maximum permissible, according to the Bye-Laws, being 2½ tons. The Bye-Laws also required that a gang (or train) of waggons should not exceed twelve in number but it appears that this rule was frequently flouted. It is on record that gangs often contained as many as 40 waggons. 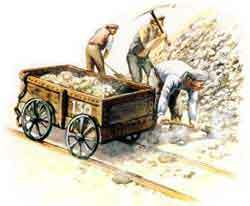 On the basis of 40 waggons in a gang, then the nett weight of such a gang was between 80 and 100 tons. To form a gang, the waggons were loosely chained together. The workman in charge of a gang of waggons was known as a waggoner and he was assisted by an apprentice. In spite of a Bye-Laws stipulating that the maximum speed of a gang of waggons should not exceed four miles per hour, it was not unusual for speeds of up to six miles per hour to be attained. The waggons were not fitted with brakes and to control the speed the waggoner and apprentice stood on the lily-pins and 'spragged' (or locked) the wheels in order to make them skid. This was achieved using a short chain having three links and a hook at each end. One hook was attached to the side of the container and at an opportune moment the other hook was thrown into the wheel, thus locking it. Virtually no records have survived to provide details of the amounts of limestone carried down the tramway. In 1808, some 50,000 tons of limestone were carried down it. In 1824, there were 207 waggons in use and 291 boats were loaded at Bugsworth in a four-week period. 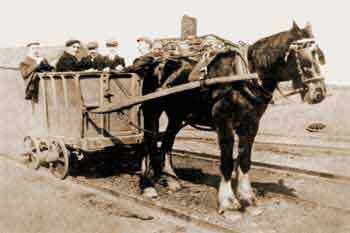 In 1833, there were 150 waggons in use, each waggon making five trips per week. In a four-week period during the same year, 279 boats were loaded at Bugsworth. On average, 1,743 tons of limestone was carried every week and a reserve of some 3,458 tons was held at Bugsworth. However, the period to which the latter statistics refer is unknown, except that it was somewhere between 1808 and 1833. By the 1880s, about 600 tons of limestone and burnt lime were being shipped out of Bugsworth Basin every day and this involved the turnaround of about 24 boats (25 tons per boat) that brought in coal (mainly for use in the lime kilns), raw cotton, vegetables and general merchandise. 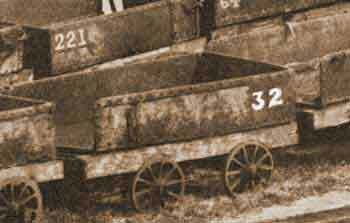 To unload incoming boats and then immediately load them with limestone discharged from tramway waggons would have required a fairly large workforce and it is fairly easy to picture the amount of activity at Bugsworth Basin in those days. Additionally, a reserve supply of limestone always had to be maintained at Bugsworth and it was necessary to stack this on wharfs and in special storage pens. By 1922, when the tramway became disused, a network of sidings, having a total length of some 6,500 yards, had developed around Bugsworth Basin, all of which had stemmed from a single line that opened in 1796. 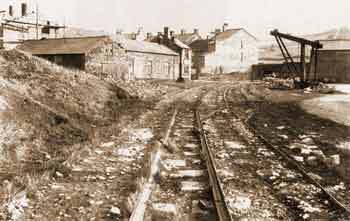 These sidings permitted the efficient marshalling of large numbers of waggons every day in readiness for their return to the quarries at Dove Holes. The Peak Forest Tramway was legally abandoned in 1925 and its most important surviving features include the elevated tramway branch to the New Road lime kilns, the sole surviving tramway wharf (platform), both at Bugsworth Basin, Stodhart Tunnel, the self-acting inclined plane at Chapel-en-le-Frith and the deep access cutting to the quarries at Dove Holes. The elevated tramway branch and the tramway wharf are now integral parts of the Scheduled Ancient Monument of Bugsworth Basin. Stodhart Tunnel is now considered to be the oldest surviving rail-related tunnel in the world and because of its importance, as part of England's industrial heritage, it is listed by English Heritage as Grade II* but it is presently on their Buildings at Risk Register. A group of three flatbed waggons standing on the gritstone wharf in the Upper Basin at Bugsworth, September 1928. Coal waggon No. 67, standing on the gritstone wharf in the Upper Basin at Bugsworth, 1930s. Waggons of this type could carry a load of one ton. Chinley Road (or Silk Hill) Bridge is in the background. 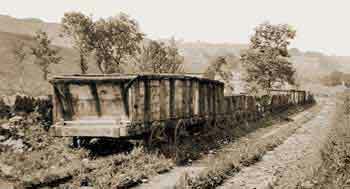 Mineral waggon No. 32 standing on the gritstone wharf in the Upper Basin at Bugsworth, late 1920s. It is waiting to be taken away for scrap. 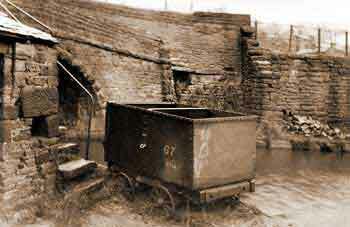 A mineral waggon standing on the gritstone wharf in the Upper Basin at Bugsworth, late 1920s. It is waiting to be taken away for scrap. 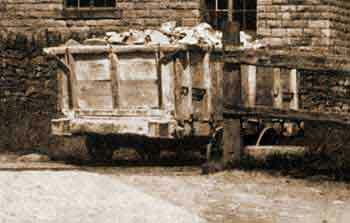 A high-sided waggon, with a long chassis, waiting outside Bugsworth School, early 20th century. It is filled with broken limestone waiting to be taken to the New Road kilns. 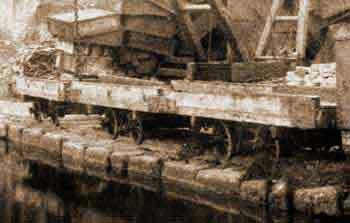 A high-sided waggon, with a short chassis, standing on the gritstone wharf in the Upper Basin at Bugsworth, c.1920. It is filled with gritstone setts, from Barren Clough Quarry, and it is waiting to be unloaded into a boat. Disused high-sided and mineral waggons standing outside Bugsworth Basin, 1928. Tramway at Lower Crist, 1928. View looking east by the entrance to Crist Quarry, which is on the right. Beyond the quarry entrance the rails have already been removed for scrap. A gang of waggons at Townend, consisting of both mineral and high-sided waggons (for carrying burnt lime), 1905. Detail of a waggoner demonstrating the method of braking a gang of waggons at Townend marshalling yard, 1905. The brake consisted of a chain with three links and a hook at each end. The smaller hook was hung over the side of the waggon and the larger hook was thrown into the wheel to catch on the rim those locking the wheel. This was known as 'spragging'. The tramway at Townend, Chapel-en-le-Frith, 1903. The committee waggon or 'spring waggon' at the Top o' th' Plane, above Chapel-en-le-Frith, 1905. A blacksmith’s shop is behind the horse and a stable building is on the extreme left. This waggon was fitted with two bench seats, one each side, upholstered with green leather and it could carry six persons. Access was by one of the central doors at each end of the waggon. The horse shafts were detachable and could be positioned at either end of the waggon, so the door used was the one at the opposite end to the shafts. Each shaft was secured to the waggon with a lynch pin and chain. When it was required to reverse the direction of the waggon the horse was unhitched and the shafts were removed and secured at the other end. The five persons are, from left to right, Douglas GOUDIE, a G.C.R. Employee, William GOUDIE, William HULME and Lawrence GOUDIE. The photographer was Arthur HULME. This permit is an example of goods, other than stone, being carried on the Peak Forest Tramway. It was never stated on canal permits that stone leaving Bugsworth Basin was brought there via the tramway. It was issued on Monday, 4 May 1807 and it permitted George Newman on board Samuel Oldknow Esquire's Boat No. 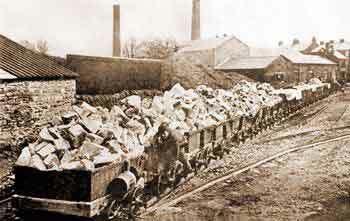 5 to carry 24 tons of limestone from Bugsworth Basin to Marple, a distance of seven miles. The boat also carried ½ ton of oats to Marple that originated at Chapel-en-le-Frith. The distance from Chapel-en-le-Frith to Marple was 10 miles, so the oats were carried three miles on the Peak Forest Tramway and then seven miles on the Peak Forest Canal. The permit was signed by William Bate, the Wharfinger at Bugsworth Basin. †Whether this was inclusive of the cost of the oats is unknown. An Act to empower the London and North Eastern Railway Company to construct new railways widening other works and to acquire lands to extend the time for the completion of certain works and for the compulsory purchase of certain lands for other purposes. Clause 54. Abandonment of Peak Forest Tramway. The Company may abandon and discontinue their Peak Forest Tramway extending from Chinley to Dove Holes and may hold sell or dispose of or apply to the purposes of their undertaking the site and soil of any part of the said tramway so abandoned and discontinued. Clause 55. Agreement with authorities and owners as to works. (1) The Company and the local and road authorities of any area in which any part of the Peak Forest Tramway to be abandoned is situate and any body or person being the owner lessee or occupier or otherwise interested in any land adjoining or near thereto may enter into and carry into effect agreements with reference to the removal construction alteration maintenance and repair by the contracting parties or any of them of embankments cuttings bridges level persons towards the cost thereof and any such agreement may provide for the transfer to and vesting in any such authority body or person of any of such works or the liability for the maintenance thereof. (2) The making of any such contribution by a local or road authority shall be deemed to be a purpose for which under the provisions of any general Act relating to the powers of such authority they may incur expenditure and any such authority may raise in like manner as money may be raised under the provisions of any such general Act the moneys necessary for the purpose of any such contribution as aforesaid. (3) If any work executed by a local or road authority in pursuance of any agreement made under the provisions of this section involves an alteration of a telegraphic line belonging to or used by the Postmaster-General the enactments contained in section 7 of the Telegraph Act 1878 shall apply to such alteration as if such local or road authority were 'undertakers' within the meaning of the said Act. Clause 54 of the above Act abandoned the Peak Forest Tramway on the 31 July 1925 and this, de facto, was the date of abandonment of Bugsworth Basin at the terminus of the Peak Forest Canal. Although the basin itself was not legally abandoned it could no longer function as the transhipment place between the Peak Forest Tramway and the Peak Forest Canal. Records made at the Marple Toll Office show that between 17 April 1928 and 12 February 1931 there were 30 deliveries of scrap iron from Bugsworth Basin to Prince's Dock on the Ashton Canal at Guide Bridge. The total quantity of scrap was 523¼ tons, which averaged 17½ tons per boatload. Two boats were used for this purpose, Mary and George, with Mary making 24 trips and George making six trips. The owner of the two boats was John Lucas and the captain was J Henshaw. At Prince's Dock the scrap was transhipped onto the railway and from there it was taken to Sheffield for subsequent melting down. The scrap merchant who dismantled the tramway was T W Ward Ltd of Sheffield and it was melted down by Edgar Allen & Co Ltd, steel manufacturers of Sheffield.